Aquilegia 'Blue Bird'. You will appreciate the very large outward facing flowers of this compact plant. The clusters of light blue and white flowers will add soft elegance to your garden. The flowers also make long lasting cut flowers. 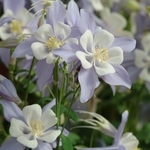 'Blue Bird' is a member of the "Songbird" series of aquilegia. Also known as Columbine, a long time favorite of gardeners throughout the U.S. and Europe. Accepting of any sunlight exposure, they are happiest in part sun.